"DANGER, Fighting Men at Work." As told by Willard G. Triest, Commander (CEC), USNR, to Edward J. Doherty. James Hughes Dancy was born September 8, 1910, in Dancyville, Haywood County, Tennessee. The son of Isaac Bradley and Ethelene Maggie Lena Hughes Dancy. With the exception of his military service and brief periods in Paris, Henry County, Tennessee, he lived his entire life in Dancyville, on the farm where he was born. A skilled bull dozer operator, James did dirt work on many farms and worked on roads and other projects, in many parts of Tennessee. His last job before enlistment in the Navy was employment with the Tennessee Valley Authority as a bull dozer operator. At the time of James enlistment, the military was in great need of men with heavy equipment operating and other building and construction skills. So much, they were offering high enlistment ranks, and accepting older men for these jobs. Because the emphasis was on experience rather than physical conditioning, the average age for operators being accepted was 37 years, and the navy was accepting construction men between the ages of 18 and 50, for this service. It was later known that men as old as 60 years had enlisted in the Seabees. James was enlisted with the naval rank of Mechanic First Class, equivalent to a five strip Technical Sergeant in the Army. You would have to be an ex-military person to realize how unusual it was to be recruiting enlisted men at this high rank, at this time. His induction record lists the following characteristics ~ age: 31 years - 10 months; height: 6 feet; weight: 148 lbs. eyes: blue; hair: brown. James was accepted for enlistment at the Naval Reserve Station, Jackson, Tennessee. He was enlisted on July 17, 1942, at the Naval Reserve Station, Nashville, Tennessee. 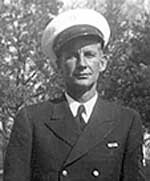 Recalled to active duty 2 months later, on August 25, 1942, he was transferred from the US Naval Reserve Station, Nashville to the Construction Battalion, US Naval Construction Training Center, NOB, Norfolk, Virginia. The next entry in James record states, " December 4, 1942 - Crossed the equator on board the USS Mount Vernon bound south for parts unknown, initiated a shell back." The Seabees built the Patrol Torpedo Boat base on Tulagi Island. The PT Boat was a wooden hulled craft, 80 feet long and 20 feet wide. The small size and wood construction accounted for it's speed of 40 knots. The crew consisted of two officers and eight to ten enlisted men. It carried two to four torpedoes and guns on deck. It has been described as, "Pound for pound, the most ferocious warship of all time." Tulagi Island was the base from which John F. Kennedy commanded his PT 109 Boat. JFK arrived there, and assumed command of PT 109 on April 23, 1943. On August 1-2, 1943, Kennedy was ordered out on patrol to intercept Japanese warships. During the night, while cruising very slowly and quietly, PT 109 was cut in half by the Japanese destroyer, Amagiri, thought to be running at about 40 knots. The crew aboard the Amagiri was not aware they had hit 109. The heroics and survival of Kennedy and his crew are documented in Naval records and the published book, " PT 109." James would have been on Tulagi Island for about 30 days at the same time Kennedy was there. Whether they ever made contact is not known. Neither is it known, at this time, if James ever knew of the Kennedy/Tulagi connection and the part he and the Seabees played in building the Patrol Boat base from which Kennedy would operate and become a naval hero. When finished on Tulagi Island, the 27th was assigned to develop camp sites at Mission Point, on Florida Island, at Gavuhoho and Siota, and on the Island of Bungana. Emirau has been described as having beautiful, crushed, white coral for roads and airfield runways and nice coral reefs surrounding the island, which made it a place for searching for shells and cat eyes and made for some nice swimming. But you had to watch for the beautifully colored coral snakes. The Seabees built an airfield at Emirau from which both the Navy and Marine Corp operated. Charles Lindbergh, while helping with the aviation war effort, visited Emirau Airfield in May 1944. James would have been on Emirau at the time of Lindbergh's visit. Emirau was the 27th Seabee's last stop in the Pacific. Transferred March 22, 1945, from 27th US Naval Construction Battalion to US Naval Hospital, Shoemaker California. Transferred Apr, 1945, from USNH, Shoemaker, California to US Naval Conve. Hospital, Santa Cruz, California, for further treatment. On June 26, 1945, given Honorable Discharge from the United States Navy, at US Naval Conve. Hospital, Santa Cruz, California. Issued Honorable Discharge Button (the coveted Ruptured Duck.) Rank at time of Discharge; Chief Carpenters Mate.